First – HAPPY VALENTINE’S DAY! Wow – this project has been a long time in the making – 6 years to be exact! But finally, RUGOSA has come to fruition! 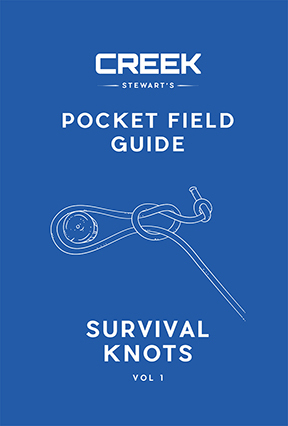 As many of you know, I’ve written a lot of books over the past 10 years or so – mainly survival guides. RUGOSA is my 1st survival fiction novel and it was a much more challenging project for me to write. First, I found it hard to write a fiction story that wasn’t personal in some way. I guess most authors have to draw on personal experience to write some of their stories and RUGOSA was no different for me. But, I guess it’s these personal draws that help to make a story relatable. I really hope that you will enjoy it! It’s the 1st book in a 3 book series, so your feedback is important to me as I write the second and third book in the RUGOSA series. 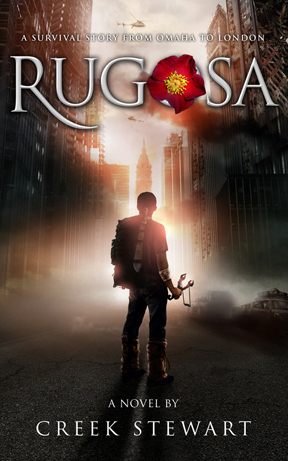 RUGOSA is the story of a young man, Omaha, who must travel 400 miles across hostile lands to save his friends (and sweetheart London) from a war-torn quarantined city. Like me, Omaha is a Boy Scout. Although Boy Scouts has been banned by the new world government, Omaha must use the survival skills he learned in scouting, and from his father and grandfather, if he has any hope of surviving the crazy journey. 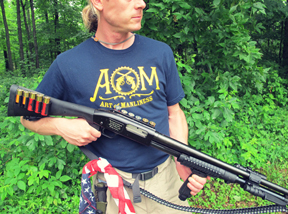 As a survival instructor first and author second, this fiction story is survival skills heavy. I think you’ll find it a unique mix of story and teaching – at least I hope so. I’ll always be a survival instructor! RUGOSA releases today (Valentine’s Day) exclusively on Amazon in both paperback and digital ebook download at this link: https://www.amazon.com/dp/0997690690 I’ll be signing the 1st 100 paperback copies sold! If you pick up a copy – LET ME KNOW WHAT YOU THINK! I hope you are well and that our paths will cross in 2017! All the best to you and yours. 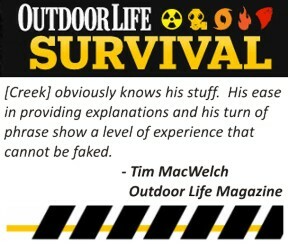 Hello Friends & Survival Enthusiasts! 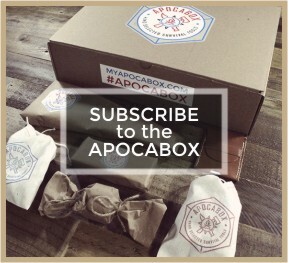 Many of you subscribed to my blog because you saw and liked a survival article I’ve written about how to repurpose everyday items to meet basic human survival needs. I’ve written a ton of them in the past 10 years. Creatively using random items for survival is still one of my favorite hobbies. 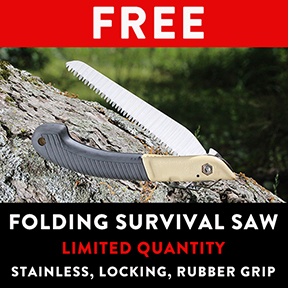 I call it Survival Hacking – the art of using what you have to get what you need to stay alive in ANY situation. In the nearly two decades I’ve been actively studying and practicing survival skills I’ve learned and seen a ton of great survival hacks. Whether from books, videos, students or other survival enthusiasts, I’m always on the look out for a new hack I’ve never seen before. Of course, I’m always trying to come up with hacks of my own as well. 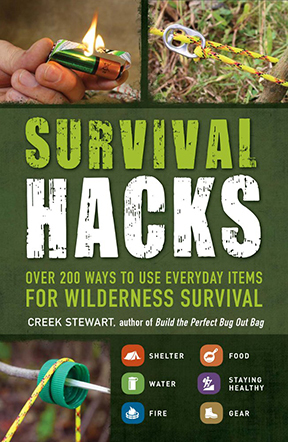 In fact, I’ve logged, tested and compiled over 200 of my favorite Survival Hacks in my new book, titled…. 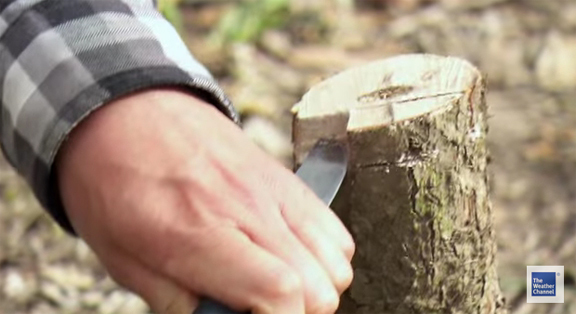 you guessed it – SURVIVAL HACKS! 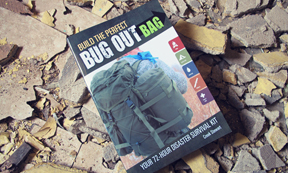 If you’re like me and enjoy a good survival hack then you’ll love my new book. It’s already on the AMAZON #1 NEW RELEASE LIST and I promise you’ll see some you’ve never seen before. WARNING: This book is going to make you want to test some of these crazy hacks for yourself!!! AND, I’m already compiling more hacks for VOLUME II so email me your hack ideas and they might make it in the next version! As always, thanks so much for your continued support! 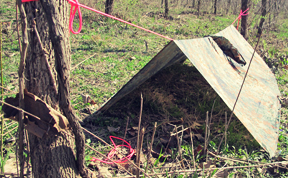 Don’t forget to send me your great survival hack ideas! If you have a live cut Christmas tree in your home this season, this challenge just may be for you! Rather than throw the tree away or burn it, how about making a fully functional survival BOW from it. 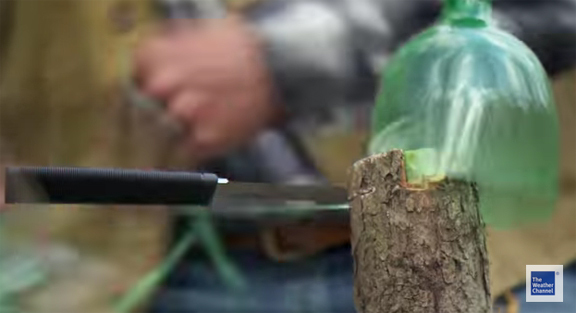 Yes, a very effective survival bow can be made from the trunk of your live cut Christmas tree! 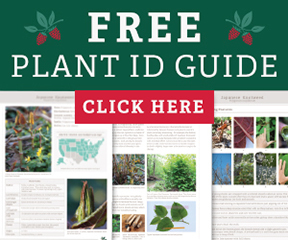 STEP 1: Drag the tree outside and chop off all the limbs flush with the trunk. 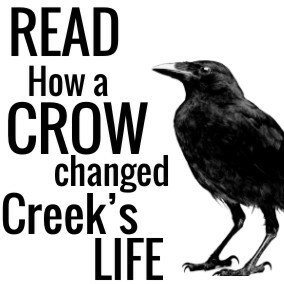 It will look something similar to the illustration below. STEP 2: Collect anything you can use for lashings and bowstrings later – ribbons, bows, wrapping twine, etc. If the tree trunk is over 2” in diameter for the majority of its length your best bet is to split it in half down its length. Once split, work with the best half. You will still have a stave that has one small end and one fat end. If small end is approximately ½ – ¾ inch thick and larger end is approximately 1 – 1 ½ inches thick then string it up and give it a go. If you are dealing with a much larger tree you can split it a second time or just do some serious tapering on the ends. The goal is to get the ends to match. Another option is to split the trunk, flip the pieces and lash the two fat ends together with a 5-6 inch overlap. If somehow you have a tree that is only 1 inch in diameter you can string it up & try as is – OR – cut it in half, split one half longways and lash the fat ends together with a 5-6 inch overlap. *It’s very common for a bow to end up asymmetrical with a longer top limb. To compensate, simply grip the bow below center. CHALLENGE DURATION: Challenge starts 12/25/15 and Submission deadline for this challenge is 1/01/16. Prizes will be announced on 1/02/16. Good luck! 2 more Holiday Survival Challenges to be announced in the coming days! You’re not going to believe what I do with this 2-liter bottle. 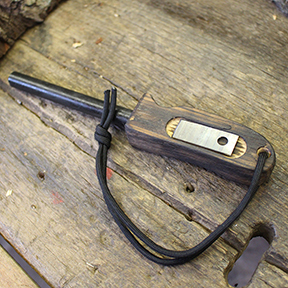 Just in case you missed the most recent episode of FAT GUYS IN THE WOODS, I had to write this blog post and show you a cool survival skill that I think you’ll really enjoy. 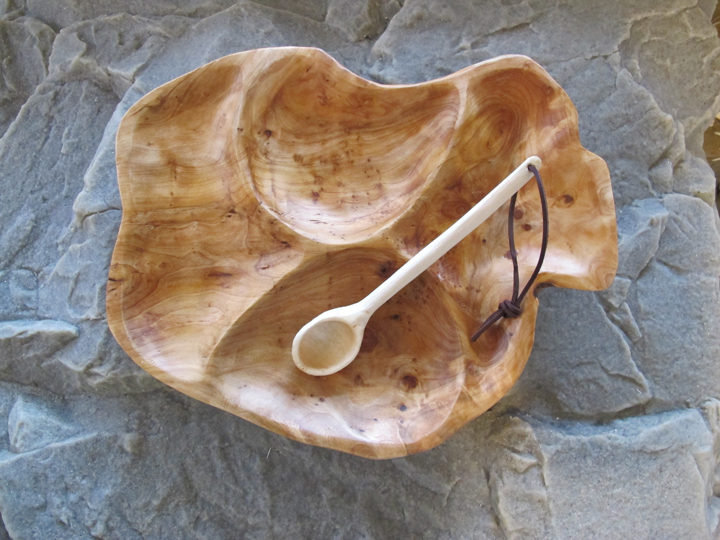 And, it’s a great way to source some awesome cordage in a pinch. I call it the 2-Liter Bottle Cordage Jig. Years ago I saw a video about how a small factory was recycling 2-liter bottles to make woven baskets. They had a fancy electric powered piece of equipment that would allow an operator to feed in trash 2-liter bottles and it would strip them into long pieces of plastic that would then be coiled on a spool and used to weave baskets. 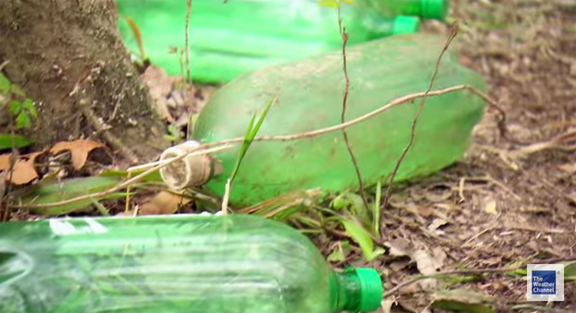 Trash 2-liter bottles (or similar) can be found all over the world, especially in coastal areas. During our week filming FAT GUYS IN THE WOODS in the Florida Swamps I decided to create a primitive version of making cordage from 2-liter bottles using just my knife, my folding saw and a sapling stump. Below is a link to the YouTube video filmed for the show that I think you will find very educational. 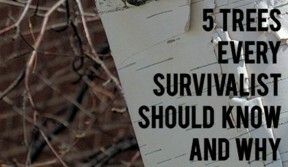 It’s rare to find a survival skill that you’ve never seen before and I’m proud to bring one to you in this post! Like I always say, survival is about using what you have to get what you need and this skill is a prime example of that philosophy.